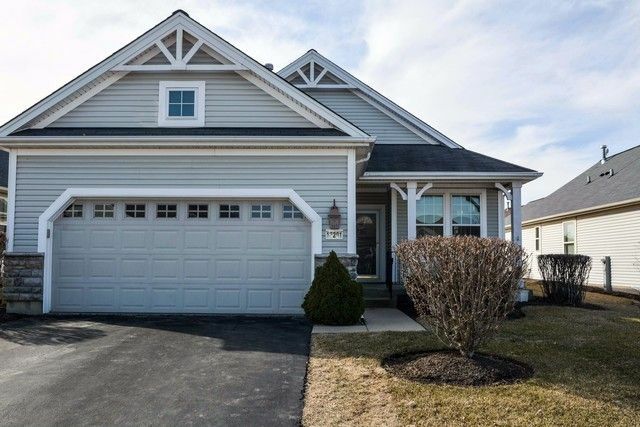 Del Webb built Nicolet model, on a cul-de-sac street, within walking distance of the Prairie Lodge, tennis courts, softball field, golf course and restaurant!! Features a bright open floor plan w/ views of the golf course from the kitchen nook & front porch. Offers ceramic in foyer kitchen w/ oak cabinets, new floor, new granite counters and pantry master bedroom with bay window two closets and bath with walk in showernew carpetnewer hot water tanklaundry room with cabinets & sink2 car garageprofessionally landscapedcome enjoy this home and all the activities that this 55 and over resort like community has to offer.